For those of you who are using video content as a part of your marketing strategy, you’re going to really like this one! And for those of you who aren’t — read on to learn why we are hammering away at the Video Advertising Research. Video advertising is a huge and constantly evolving market. Publishers are now aggressively investing in promo video experiences at a rapid pace, which gives brand marketers more opportunities. In order to keep up with the industry, we’ve extended our databases to one of the most booming and promising regions for video advertising – the United Kingdom. And to improve the experience of exploring and analyzing YouTube data on in-stream video advertisements and channels, we’ve refurbished our US database. From a technical standpoint, our data aggregation is now more accurate. Now, our existing databases are significantly more precise in regard to regional factors. We are geographically present in the selected region and we now look for promo videos the way our users would, which means when you’re searching for a specific type of video content in a certain database, you are far less likely to stumble upon irrelevant results from other regions. In other words, both our UK and US databases are clutter-free, and you can easily and conveniently surf the video turf. We’ve slightly changed the database selector: it now displays the currently selected country and allows you to click on a link to unfold a drop-down window showing all the countries SEMrush covers. 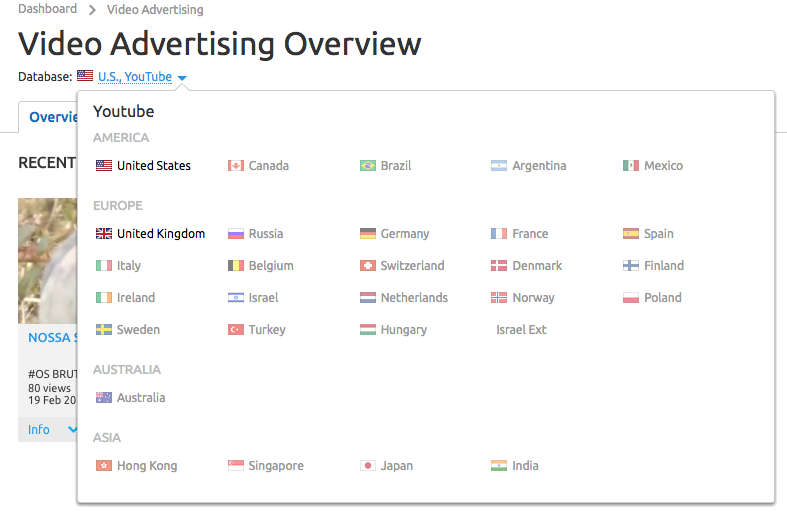 Currently, Video Advertising only has a UK and a US database, but we’re working on expanding it further to include other countries, so help us pick which ones we should build next! In addition, we now detect promo videos with a higher frequency than before, and deliver actual data at the time of query for both the UK and US databases. Also, you now have the option of grouping the results for ads and videos in a list. This type of interface allows for easy navigation, and lets you sort results based on such metrics as the number times SEMrush found this advertiser broadcasting the video ad, the number of views, and the date it was published. In case you’re looking for custom database results for regions not currently covered through SEMrush’s regular service, an extensive list of keywords, or even a full list of AdWords advertisers, you can order a custom report. Finally, we’ve also added an Advertisers Activity graph, which displays how many times a promo video has been found within a set period of time on a particular channel compared to all other channels that broadcasted this promo videos during that time. If you’re still caught in the conundrum of trying to decide whether to embark on video advertising, go check out what’s happening in the market right now. Your competition might be capturing the attention of your potential clients. How’s that for a reason why Video Advertising Research is worth giving it a shot? Oh, and just a heads-up, you can expect more updates coming this week, so stay tuned! Send us all your questions, comments or suggestions at [email protected]. Thank you for helping us make SEMrush better!